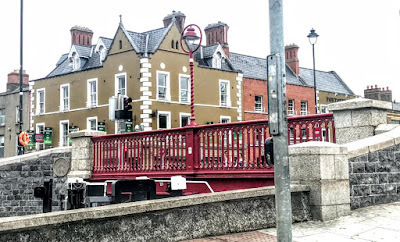 I always thought the bridge crossing the Grand Canal on the road from Rathmines leading onto South Richmond Street and into Dublin city centre was known as Portobello Bridge. Sometimes, I might even have even called this Rathmines Bridge. Portobello is also used as the name for the area north of the stretch of the Grand Canal between La Touche Bridge and Robert Emmet Bridge, which crosses the canal between Clanbrassil Street and Harold’s Cross – and in this case, I had always known this bridge as Harold’s Cross Bridge. With its ruby red railings and lamp posts, the bridge at Portobello is attractive in the summer sunshine. As a young teenager living in Dublin, I often crossed the Grand Canal at this point, sometimes perilously using the canal lock agates a footbridge. More venturous and daring children swam in the Portobello Basin or dived into the canal lock. As I was on my way into the city centre yesterday [6 August 2018] for Irish CND’s Hiroshima Day commemoration, I noticed a cartouche on the side of the bridge telling me that its name is La Touche Bridge. The bridge at Portobello was built in 1791, and was named after William Digges La Touche (1746-1803), a member of a prominent Dublin banking family and a director of the Grand Canal Company. Portobello means beautiful harbour, and I always thought the Grand Canal in Dublin and its bridges at Rialto and Portobello were romantic reminders of Venice. After all, the Portobello Market in London is right beside Little Venice, and the ‘Grand Tour’ may have been part of William La Touche’s education. But Wikipedia entries claims that both Portobello Road in London and Dublin’s Portobello were named following the capture by Admiral Edward Vernon in 1739 of Puerto Bello or Portobelo on the Caribbean coast of Panama, during a war between Britain and Spain known as the War of Jenkins’ Ear. Portobello began to develop as a small suburb in the 18th century, centred on Richmond Street. A hotel at the harbour opened in 1807, and during the following century the area was fully developed, transformed by the Portobello Gardens and solid, Victorian red-bricked homes and terraced houses, including the birthplace of George Bernard Shaw. In a tragic accident in 1861, horse-drawn bus driven by Patrick Hardy plunged into the lock after one of the horses reared. The horses became uncontrollable, backing the bus through the wooden rails of the bridge. The horses and the six passengers drowned in the 20-ft deep cold waters of the lock, while the conductor jumped to safety and the driver was pulled out by a passing policeman. One of the people on the bus was the father of the Gunne brothers who opened the Gaiety Theatre, the others included two mothers each with a little girl, one a niece of Daniel O’Connell. The bridge was also the location of two events during the Easter Rising in 1916. A group from the Irish Citizen Army seized Davy’s Bar near the bridge, and it was here too that Francis Sheehy-Skeffington was arrested on 25 April 1916 on his way home to Rathmines before his murder. As for William George Digges La Touche, he had an interesting and colourful life. He was the eldest son of James Digges La Touche and a grandson of David Digues La Touche (1671-1745), the founder of the Irish branch of the La Touche family, who fled from France to Amsterdam as Huguenot refugee after the revocation of the Edict of Nantes in 1685, and eventually moved to Dublin. William George Digges La Touche was born in 1746, and after attending Saint Paul’s School in London, he moved in 1764 to Basra, then part of the Ottoman Empire and now part of Iraq. There he later became the British Resident or diplomatic representative. When Zobier was captured by the Persians in 1775, La Touche ransomed the inhabitants at his own expense, and so saved them from slavery. During the siege of Basra in 1775, La Touche gave shelter to the principal citizens and their families in the English compound. La Touche returned to London around 1784, and married Grace Puget, the daughter of a London banker. He then became a partner in the La Touche bank in Dublin, and his fortune increased he built a family mansion on Saint Stephen's Green, and bought Sans Souci in Booterstown as his country house south of Dublin. He died in Dublin on 7 November 1803.